We all dream of living in a world where we always know where our car keys are and our home doesn’t look like a tornado five minutes after we cleaned it, but let’s be honest, who has the time? Or the energy? Life was made for more than constantly organizing and reorganizing your home, but at the same time taking a few extra minutes to put things in their place can save you a great deal of time in the long run (like that extra hour you spend finding those keys when you are already twenty minutes late for work). Studies have also shown that those who live in a cleaner and more organized environment sleep better and perform better in the workplace. Still, with so much to do how are you supposed to keep up on keeping things organized. Don’t worry, we’ve got your back. We’ve put together a list of our favorite organizing tricks that require little to no energy, and will restore sanity to your home and life! When you're ready to start these projects, visit DealsPlus to find coupon pages for all your DIY needs. Whether it's a small project and you just need glue or some small brushes, or a big project that requires large pieces of wood, we have something for everything. 1. 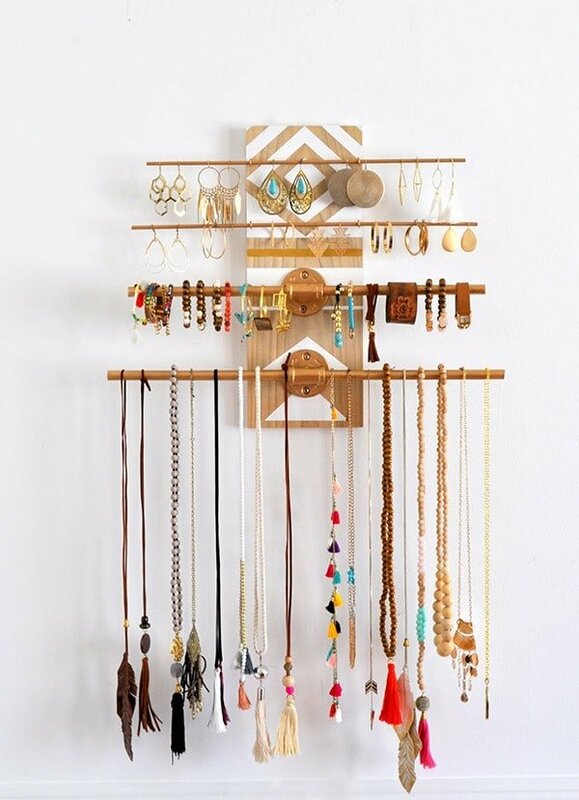 Establish a place for jewelry. Check out the tutorial for this DIY Geometric Industrial Wall Jewelry Organizer at Made in a Day. Necklaces, bracelets and rings appearing all over the house (except when you need them)? Picture frames, cork screw boards, and traditional jewelry holders are an inexpensive way to keep all of your bling where you can see it. They are also extremely easy to make yourself. 2. Add dividers to your drawers. We all know that trick, you scoop everything into your empty draw space and TA DA your counters are clean! That is of course until you come to open them again and it overflows with all the jumbled up objects you put in there. Pick up a few wooden, plastic, or vinyl dividers and place them into your drawers so that the next time you need to hide away objects in a hurry, you can keep them organized while doing so. 3. Keep track of appointments and notes. Find the tutorial for this DIY Chalkboard Wall Calendar at Jen Loves Kev. Phone numbers, notes and appointments getting lost and scraps of paper or post it notes? Pick a high traffic area of the house like the living room or kitchen and hang an oversized cork board, whiteboard calendar, or chalkboard wall so you never have those “I need a piece of paper” moments, and everyone stays aware of other peoples agenda. Don’t just toss out those glass jars, clean them out and use them as a great way to store cotton balls, q-tips, pens, safety pins and other small items that usually end up scattered all over the place. Keep snacks, spices, sugar, pasta, and grains in large glass jars. Not only will this help take up less space, but they will also be attractive enough to hang on a shelf instead of stuffing in a pantry. You will also be able to find what you need much easier. There’s no organization when you’re holding on to every clothing item or piece of paper that you no longer need or use. Take on the Japanese technique of cleansing your space by analyzing each item and asking yourself if it brings you joy or if it’s useful, if not it’s time for it to go. 7. Dedicate a space to your keys. You can find the tutorial for this Entry Message Center from Lowe's. And stick to it! Think of all the things you need before venturing out such as your wallet, keys, sunglasses, and phone charger and dedicate one drawer to it. This way when it’s time to go all of your important items will be right where you left them. Notes on your phone, notes on your computer, notes in your ipad, notes in your notebook…when we’re on the go it seems like notes end up everywhere. Streamline the process and download the Evernote app to easily organize your notes and ideas, and have them synced on all of your deviced automatically. 9. Get those shoes off the floor. Get the tutorial to make this DIY Ladder Shoe Shelf from A Pair & A Spare. Got a Bradshaw worthy shoe collection but no closet space? Those ugly shoe organizers are not your only option! Try installing picture rails as the perfect place to a add a pop of color to your walls and easily hang shoes. Or you can make your own! Labeling things might sound like organizing to the extreme, but once you’ve seen how beautiful some of the decals are out there you will want to label everything. Fire up the laser printer and go crazy. 11. 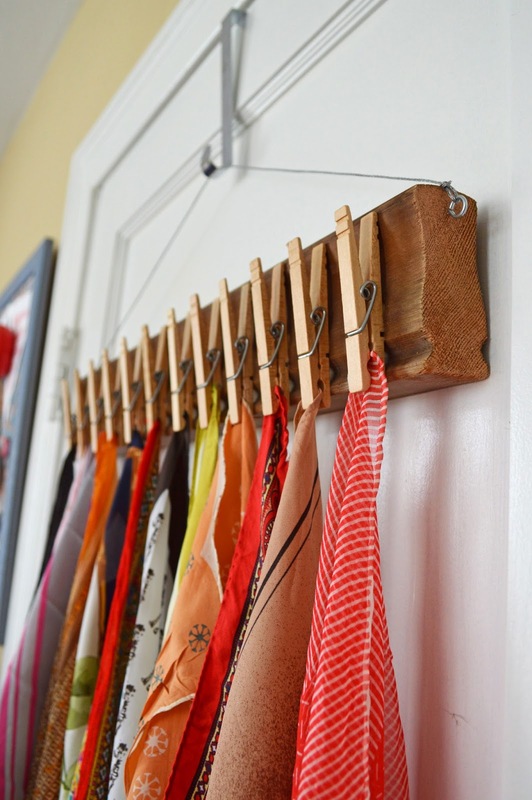 Hang scarves up with clothes pins. Find a video tutorial for this DIY Clothes Pin Scarf Holder at Sally Ann. Gorgeous scarves should be kept on display, not buried in your dresser taking up valuable space and begging to be attacked by moths. Attach clothes pins onto a wire hanger as an easy way to store multiple scarves and easily access them whenever you need them. 12. Hold on to candy containers. Altoids, tic-tacs, and icebreaker containers are the perfect place to store items like those two hundred bobby pins that you buy each month and seem to magically disappear. 13. Use up small spaces. Find the tutorial for these Rolling Storage Crates at Teal + Lime. Purchase a rolling crate as an easy way to add extra storage space under beds and cabinets. It’s also the perfect place to store winter clothing when the weather gets warm to help save on closet space. 14. Keep kitchen supplies in wire baskets. Wire baskets can easily be mounted onto the wall to help add storage space and unclutter kitchen counters. This is also a perfect technique for having cooking items on hand when you need them in a hurry. When all else fails, at least this simple task will make you’re the rest of your room look a bit more organized…sort of.